Nomegestrol acetate is a corticosteroid hormone. Testolactone is a progesterone derivative with antineoplastic activity. Aglepristone is a synthetic, steroidal antiprogestogen. Ethynodiol diacetate is a synthetic progestational hormone used alone or in combination with estrogens as an oral contraceptive. Norgestimate is a steroid ester, a ketoxime and a terminal acetylenic compound. It has a role as a contraceptive drug, a progestin and a synthetic oral contraceptive. Norethindrone acetate is a female progestin approved by FDA for the treatment of endometriosis, uterine bleeding caused by abnormal hormone levels, and secondary amenorrhea. Chlormadinone acetate is a steroidal progestin, with antiandrogen and antiestrogenic effects. Levonorgestrel is a synthetic progestational hormone with actions similar to those of PROGESTERONE and about twice as potent as its racemic or (+-)-isomer (NORGESTREL). It is used for contraception, control of menstrual disorders, and treatment of endometriosis. 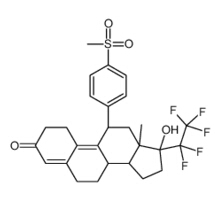 WAY-255348 is a potent nonsteroidal progesterone receptor (PR) antagonist. Vilaprisan, also known as BAY1002670 or BAY10-02670, is a potent and selective oral progesterone receptor modulator that holds the promises of long-term treatment of patients with symptomatic uterine fibroids.